Nanobacteria is the name given to a proposed class of living organisms. Whether these structures represent life is a matter of some controversy. In this case study, students review the evidence of scientists on both sides of the controversy. The vocabulary and concepts presented are advanced, and students work in small groups to understand what the observations and data really mean. 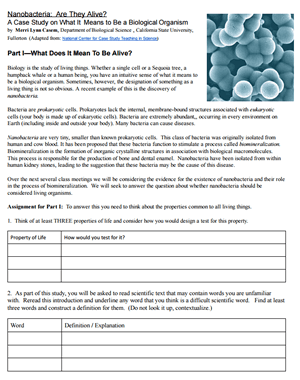 The project ends with students writing an individual essay stating whether they believe the evidence is compelling enough to claim that nanobacteria are indeed living organisms. This case was modified from a similar case found at NSF. This is a good case to introduce in the first chapter/unit where students are given the typical list of traits that are found in living organisms. Advanced students will come to the conclusion that the list is not all the useful when encountering unknowns that have some, but not all of the characteristics of life. Also recommended that students have access to google so that they can look up some of the more difficult vocabulary words.